You're quoting me from 4 years ago. Quite a few apps can do conversions now, as can most Samsung Galaxy phones. Evernote, sadly, not yet - though it can search within handwritten text. Perhaps I missed something, but I thought I read something that Evernote could convert my handwriting to text. Any help would be very much appreciated. If you are thinking that Evernote actually converts handwritten characters into typewritten counterparts, that won't happen. I can't think of any application off the top of my head that has this capability, let alone one that has direct tie-ins to Evernote. The closest thing I can think of might be some product or service offered by Livescribe. What you do get - within the limits of your handwriting and the clarity of the image in the note - is a kind of OCR that makes the note searchable. Ah, found what I was looking for. I didn't realize that it was already integrated into the Note 4 OS. I works wonderfully with Evernote. Yes, I found that "Note" works great for converting handwriting to typed. However, I think that is a Samsung Galaxy Note proprietary app??? Can you please expand on this comment? I've found that the only place in EN where handwriting is auto-converted to text is when I use the widget and do a quick reminder, and even then it's only the title. I'm not seeing any other place in EN where I can do a handwritten note and convert the handwriting to text. I *do* know that this feature is available in Samsung's S-Note app but I'd really like to stick with putting everything in EN. Are you saying that you use the S-Note feature to create and then send those notes to EN? Thanks! ETA: I guess I'm really just looking for your explanation on what you're using to do this and how. MyScript's Smart Note can convert handwriting to text. You can export a converted page at a time to Evernote. No Samsung Note necessary. I dont know how much/if you are willing to pay for an app, but 7Notes has handwriting to text capability and it can export to Evernote. However, this feature is only available in the premium version. I have used it some myself, but converting handwriting to text really wasnt that important to me, so I havent really explored all the possiblities of the app. I am still looking for the perfect stylus/handwriting app myself. It's OneNote that can convert handwriting into text. I was having great success since last spring using text note with the stylus on my Note 4 to take notes that converted to text. A few days ago something changes so I can only do that in the title part of the note but when I go to the main note area it only lets me draw or use the keyboard. This change makes Evernote generally useless for me. What happened? I have a Note 4. 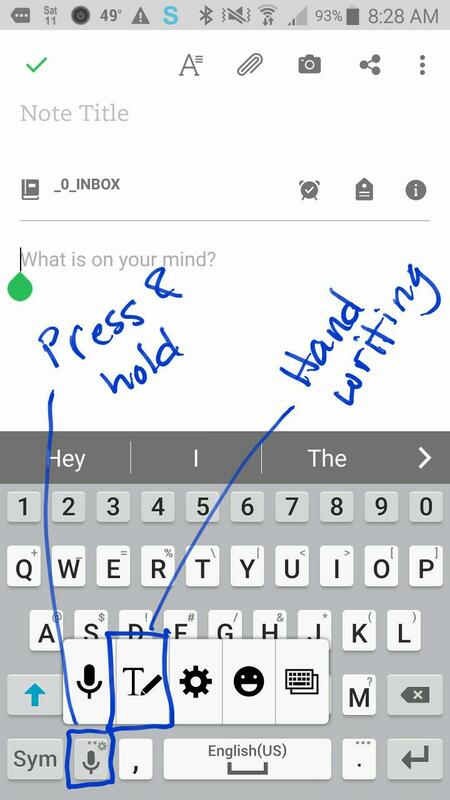 If I use the Samsung Keyboard and select the handwriting option, it will convert to text in Evernote. It's a keyboard function, not Evernote. Instead of the qwerty you get a writing area. Hope that helps. I'm with AT&T and they did a big 'upgrade' that appears to have confused some of my routines. Yes, that's true about the Samsung keyboard. However, the Samsung S-Pen used to work to convert handwriting to text directly in the Evernote editor, but that is no longer the case, because of changes Evernote made to the editor. Some of the posts above refer to that (without naming it specifically). Dave in Decatur, that sounds lie what happened to me. 2bejoyous, Thank you! I am now way more joyous though not too joyous! My main use of this phone is to take notes at meetings. It was a real stinker to have that fail. Thanks! been looking for this for over a year. Was very disappointed When I couldnt find this function anylonger. I used to just hover over the text field and a Blue "T" would popup like it still does in the Title block. one more observation is that I can only find this softkey in the, "Samsung keyboard' I usually use swiftkey for which I have not found a softkey to access this function. again, thanks for write out an explaination. 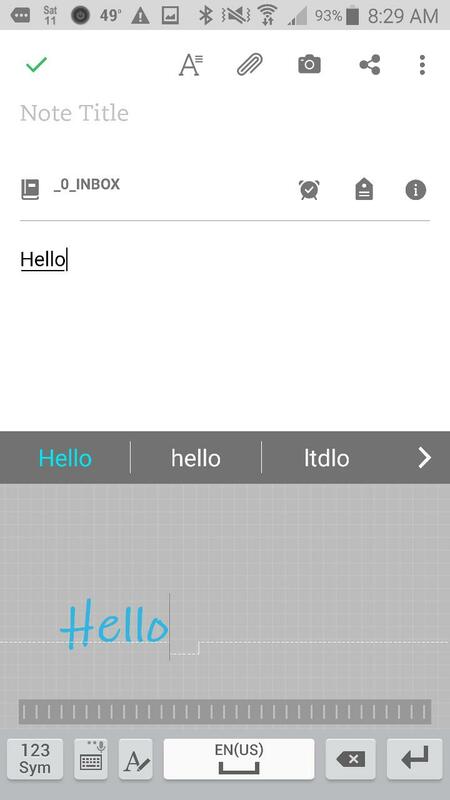 If you install MyScript Stylus (available for android and ios), then you can use handwriting input for any text field, including the Evernote editor. The handwriting is automatically converted to text and the recognition is very accurate. Great suggestion, @EverEvolve! Going to file it away for future checking out (in my Evernote "Using Evernote" notebook of course!). MyScript Stylus is really an awesome program. Just read the thread above and downloaded it onto my Samsung Note 8. Works great for text and SM messages and also in Evernote on the phone. My main computer is a Surface Pro 4, and I am wondering if there is an Evernote option (for handwriting to text) in the Windows 10 OS? There is still no software on the market that take handwritten notes on old-fashioned paper and convert them to digital texts. That technology still does not exist. Yes you can write with an electronic stylus with an app and it will easily convert to text. Also you can scan handwritten notes and Evernote will search the legible text but that is about it. Thanks DTLow, will give this a try. I hope this is not ABBYY Finereader as I just downloaded it yesterday and ZIPPED it was 1.5G and unzipped 3.4G with over 4,000 installations files. Literally took over 3 hours to install and NEVER figured out how to use the software. It was industrial software for programmers, IT geeks only. So I uninstalled the entire thing. But this looks completely different is called FlexiCapture which is different than FineReader. Will post results ... soon. UPDATE: Spoke with ABBYY Flexicapture director of sales and you are correct. It is VERY restrictive of what the software can convert. The handwriting must be in a structured form with blocks for each letter and the software "learns" the handwriting or guesses the letters written and converts them to digital text. The starting price of the software is $4,000 which is 10x the price of ABBYY Finereader. He said that if you have a page of handwritten notes, the software will not work at all - it would come out jumbled. I can now rest my search for the "magical" software that converts handwritten notes. Thanks DTLow for the info and heads-up. I do appreciate this forum. I will scan my handwritten notes into Evernote and use the search feature as mentioned a million times by others ? I'm actually trying to commit to note taking apps with my iPad like GoodNotes and Notablity. They do an amazingly good job of converting my handwriting. And I still carry a small paper notebook in my pack because digital is not a complete solution. Chris, I realize this is aside from the point of the thread, but I hope you may find time to give FineReader another shot. It is complex and not outstandingly intuitive; but I've used it successfully, and I'm not a programmer (whether I'm an IT geek among my other geekinesses, I'm not sure). It's not easy to learn on the fly; I keep finding that I've forgotten how to do some things. But it has a lot of capabilities, and might repay time dedicated to learning it, if you have the time. Mostly, I'm carrying on using Evernote's OCR search feature. I have a cheap OCR tool (PDF OCR X) but I only use it on an as-needed basis. @DTLow, of course it's a matter of one's needs. FineReader can OCR many, many languages, rotate text, split side-by-side pages into two, save to multiple formats (meaning it can scan a PDF that's image-only and save it as a full-text PDF, Word doc, or RTF doc). It's overkill for receipts or customer service notes, but useful in more high-end contexts. @Dave-in-Decatur Thanks for additional information. I like to take notes on physical paper. Will FineReader read my handwritten notes and convert them to digital text? Ah, that, unfortunately, I don't think it can do. Unless you take your notes in something like a nice, clear Times New Roman! Actually Rocketbook does exactly this. It’s a notebook for handwriting/sketching/etc. you scan the page and set destinations such as Evernote, email, etc. it can convert handwriting to text and file just where you want it. The 36 pages are also reusable. The rocketbook everlast comes in 3 different sizes. My new favorite thing! Thanks, @tezra! Welcome to the forums too! The system recommended a month ago by @tezra a few posts back, Rocketbook, does seem to be able both to turn handwriting to text and send to Evernote. Haven't tried it yet myself, but Tezra was loving it!